There is little doubt that football is one of the most popular sports across the world. When it comes to tournaments and events between teams, there is perhaps not many sporting events that can match the popularity and reach as that of football or soccer as it is also referred to. There are many events and tournaments related to soccer which keep happening across the world. However, it is quite obvious that there is one event which is the most popular. It I the FIFA World Cup which keeps happening every four years. The next World Cup is not very far away, and it will be held in 2018. The last World Cup was famous for the stunning performance of Germany who walked away with the winner’s title in style after they defeated Argentina 1-0 during extra time. Their 7-1 victory over Brazil in the semi-final was stunning. Argentina, on the other hand, had a tougher match. 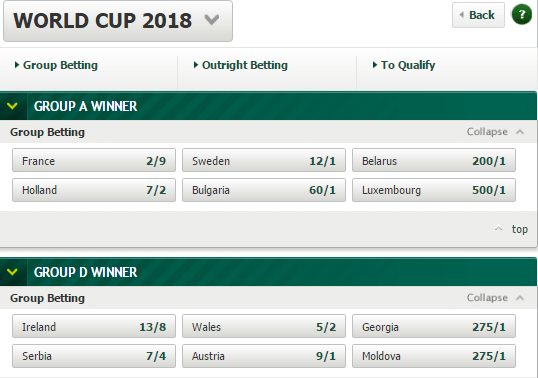 Now that 2014 is far behind us the focus now shifts to 2018, and therefore World Cup betting for the 2018 matches have started in right earnest. It is no secret that football and the World Cup matches are highly betted, and it starts from the qualifying stage. As far as the main matches are concerned, it is quite possible that the betting could run into millions of dollars. It would, therefore, be interesting to have a closer look at the World Cup betting odds as far as the ensuing 2018 tournament is concerned. It would be pertinent to mention that there are the same teams of 2014 which were considered to be strong still continue to rule the roost. 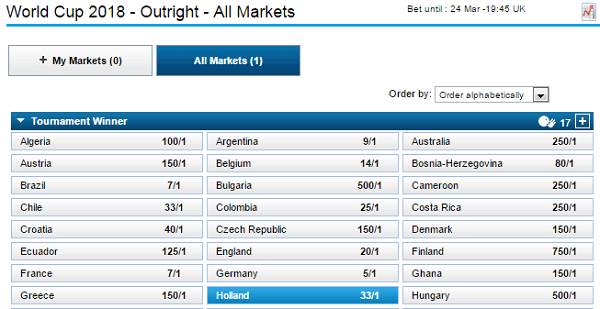 Hence, let us try and have a look at the FIFA World Cup betting odds as far as the various major teams are concerned. There is no doubt that because of their stunning performance in 2014, Germany continues to be the most favorite team. They have an odd of 9/1 which means that there is a 10% chance of Germany retaining the World Cup. 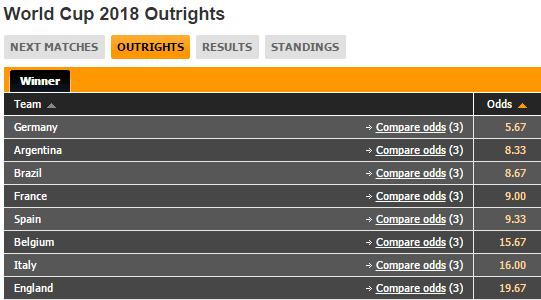 Though this looks a bit out of the way, many punters, however, feels that Germany might find it difficult to hold on to the title as far as 2018 is concerned. Whether they might have lost 7-1 to Germany in the semifinal or whether they might be insipid in their form, there is no doubt that the Brazilian football team always inspire awe and excitement amongst of thousands of die-hard football fans. Hence, there is no doubt that 2018 will also be no exception as they are likely to make a strong bid for the title next year. This is reflected by the fact that they have an odd of 7/1. This actually translates into 12.5% chance of winning the tournament which though better than Germany may not be the actual representation of the strength and potential of this team. Hence, one should consider the overall strength of the team and then decide as to their actual potential. France has always been a tough team to beat, and therefore 2018 will also be no exception as far as this team is concerned. 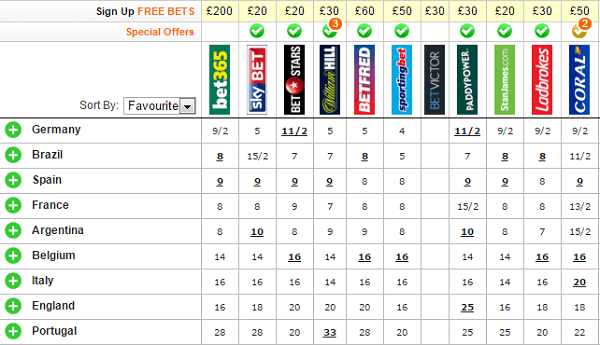 They have the same odds as that of Brazil of 7/1. This means they have around 13% chance of winning the tournament and hence if one takes a calculated risk and bets there are reasonably good chances of winning big money. But per some experts, they have a much higher chance than what bookmakers and punters are ready to offer them. Hence, when one can combine their actual potential with what the bookmakers have to offer, it certainly could make them as a team to bet upon. No FIFA World Cup betting will be complete without considering the chances of Argentina. Having won the World Cup twice before and has been runner-up thrice. Hence, they are the team to be on the lookout for and this reflected by the fact that they have an odd of 9/1 in their favor meaning that they have a 10% chance of winning the World Cup and this seems reasonably an accurate prediction as far as bookmakers are concerned. However, it would depend on the team which they can bring to the 2018 World Cup. Nonetheless, there is no doubt that they are one of the top favorite teams slated to win the FIFA cup in the year 2018. Spain has won the World Cup once, and though they are supposed to be a talented and skilled team, the overall results on the field do not match this expectation. Hence, it is likely that they might go out of the way to set the records straight as far as 2018 World Cup is concerned. Therefore, when it comes to calculating the FIFA World Cup betting odds, it makes sense to take Spain into the serious reckoning. They have an odd of 9/1 in their favor making them 10% favorites as far as the 2018 World Cup possibilities are concerned. There is no doubt that Holland was once a great team and they started the concept of total football way back in the 1970s and 1980s. Hence, it is surprising when we find that they have been given only a very little chance of winning the World Cup by the punters and bookmakers. They have an unhealthy odd of 33/1 in their favor meaning that bookies are not ready to put too much money into this team. Hence, if you are a diehard fan of Holland and are willing to take a big risk, you could end up winning big money. The above are some of the teams which have been selected based on the ranking of odds. There are other teams like England, Italy, and perhaps even Belgium who has the capability of winning the title but it remains to be to what team they can present for the 2018 FIFA World Cup.